The giant water bug (Lethocerus indicus) is a species native to Taiwan, which is facing extinction owing to environmental change. We found the insect and eggs in a pond next to a paddy field in Tongxiao Township, Miaoli County. To conserve this rare water bug, we encouraged the farmers to apply eco-friendly farming methods by contract farming and community support. 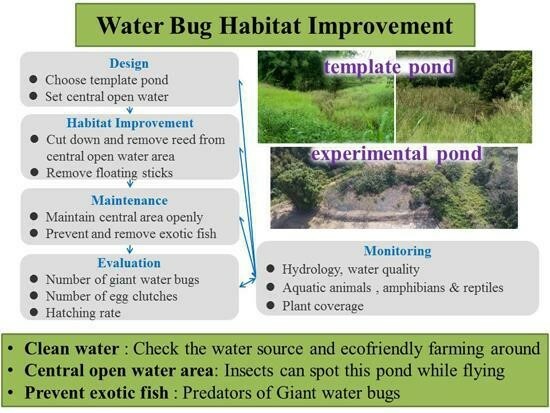 Many practices are being conducted to achieve sustainable development and the Satoyama Initiative in local agricultural production, such as monitoring the leopard cat and the small Indian civet, improving pond quality as a habitat for the giant water bug, and recovering rare plants along footpaths between paddy fields. 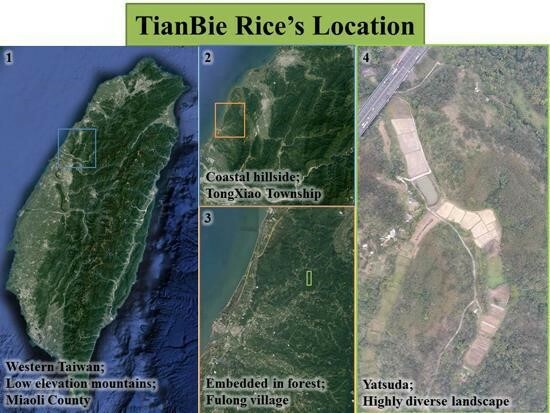 The TianBie Rice Project was started in 2012, when the Observer Ecological Consultant Co. conducted a wildlife survey, which was delegated from the Taiwan Area National Freeway Bureau. We found a specimen of the giant water bug with its eggs in a pond next to Freeway No.3 at Tongxiao Township. The pond was owned by a paddy farmer who was glad to accept contract farming and to conserve the giant water bug. Step by step, we are certified for green conservation, leopard-cat-friendly farming and organic farming. The Satoyama Initiative is practiced by collaboration between rice farmer stakeholders, the farm manager, and wildlife surveyors. The location is in a valley near Huoyan Mountain, Tongxiao Township, Miaoli County, Taiwan. The geographic climate zone is central-western, with wet summers and dry winters. The Hakka people terraced fields and created ponds to cultivate rice in the valleys. They also harvested crops such as lemongrass in hillside fields. Over the past decade, most of the paddy fields in the area were abandoned, due to shortage of irrigation water supplies and manpower in the steep hills. Only a few terraced fields are still cultivated, while hillside fields have gradually returned to acacia forests or mixed forests of bamboo and broad-leaved trees. The paddy field in question is about 1.2 hectares in area and is irrigated by ponds and a trench system. This area is surrounded by forest, meadows, and dryland farming, containing diverse habitats to maintain an abundance of natural resources, resembling the yatsuda paddy fields in the satoyama landscape. The giant water bug (Lethocerus indicus) is in the freshwater hemipteran family Belostomatidae, and is native to northeast and southeast Asia. It is the largest water insect and is a predator of aquatic ecosystems in Taiwan. The adult body length can reach 8 cm, and it can be found in wetlands such as paddy fields, ponds, and lakes. The breeding season is from April to September, and the female lays her eggs on the leaves or branches of an aquatic plant as it stretches out of the water. The female then leaves care of the eggs to the male, who is responsible for protecting the eggs and keeping them moist. When the eggs hatch, nymphs fall into the water and become adults after 45 days. 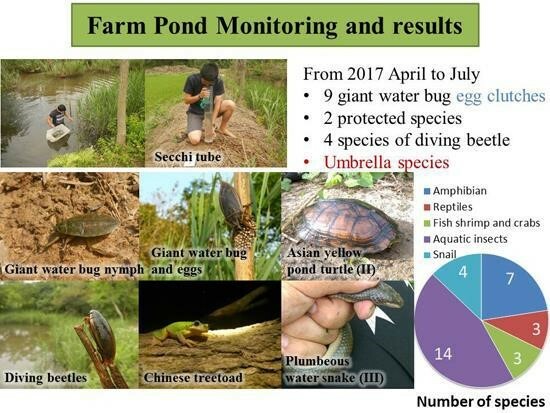 Taiwan paddy field management has changed considerably over the past 50 years, and, as a consequence, the population of the giant water bug is decreasing rapidly due to habitat loss, light pollution, prey shortage, and pesticides. 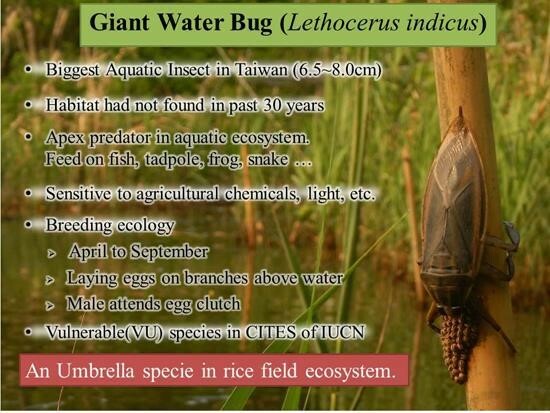 Although the status of the giant water bug has been categorized as vulnerable in the IUCN Red List of Threatened Species, it is not a protected species in Taiwan because of lack of research or recent field data. The TianBie Rice Project operates through collaboration between an experienced local farmer and a young ecological researcher. They work together to restore traditional eco-friendly farming practices and to organize the community to support the research and conservation activities. In order to conserve the giant water bug, we manage the farm environment using eco-friendly practices. Constructing a buffer at the foot of the slope as a wildlife refuge. We constructed the buffer in the form of a mud trench and ridge at the foot of the slope. This acts not only to protect crops from the runoff from heavy rain, but also to control water level efficiently. During the mid-season drainage of the paddy field, the buffer zone acts as a refuge for aquatic wildlife. During the rest of the time, the buffer also provides a corridor and foraging habitat for terrestrial animals. Using the irrigation pond as a habitat for aquatic wildlife. We maintain the water level and the vegetation in the irrigation pond annually to prevent silting, so that the pond can act as both an irrigation reservoir and an aquatic wildlife habitat. In addition, the aquatic wildlife fertilizes the irrigation water. Non-use of pesticides, in order to conserve We use no chemicals, such as pesticides, herbicides, and tea seed meal (used in aquaculture to control unwanted fish and insects), which can cause death of wildlife. Instead, we apply traditional knowledge to minimize the weeds and apple snails that affect crops. For example, the paddy field is leveled carefully by manpower before transplanting, so that the water level can be precisely managed to lower pest seed germination; apple snails are lured by bran and removed by hand. We value the relationship between farmers and consumers. Thus, contract farming and the involvement of rice stakeholders are used to build trust for the mutual benefit of all. Contract farming: In order to encourage farmers willing to adopt eco-friendly farming practices, we guarantee to pay an annual contract fee based on farm area, rather than the amount of crop produced. In this way, farmers’ income will not decline year-on-year due to unpredictable factors, such as typhoon, pest, disease or drought. Furthermore, as productivity of the farm area is not the top priority, farmers can focus on quality and safeguarding the environment. Rice stakeholder system: We guide consumers who are interested in nature and agriculture onto the farm. Through observation of nature, farming experience, and rice pre-ordering, consumers become the farmer’s friends. Therefore, a stable network is established to support the Satoyama Initiative and agricultural products. 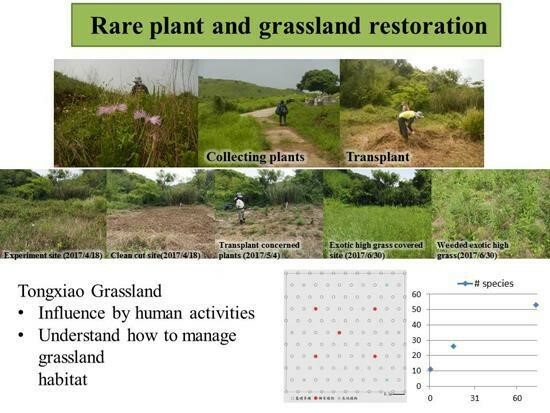 To plan the TianBei Rice conservation strategy, we identified ecological resources by reviewing papers, and carrying out landscape analysis and ecological surveys. 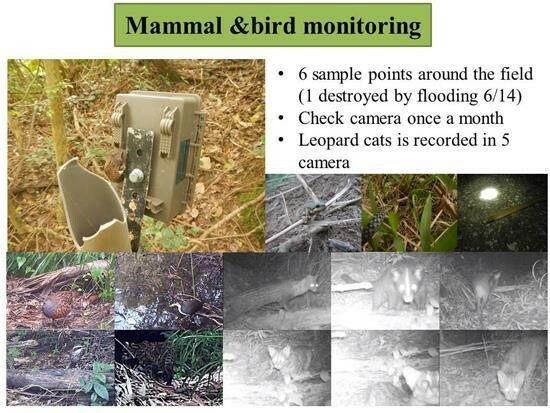 To understand the relations between leopard cats and agricultural practices, we put motion-activated trail cameras on the wildlife corridors, field ridges and ditches, and we maintained these paths, unblocking them regularly. We also carried out bird and nocturnal animal surveys each month, recording where and how protected animals, like leopard cats, small Indian civets, crab-eating mongooses and crested serpent eagles use the paddy field. We surveyed 231 ponds in the Tongxiao area and recorded the characteristics of each pond. Thirty ponds were inhabited by the giant water bug. Based on the survey, we improved two ponds in our field. The improvement procedures included maintaining a fresh and clear water source, protecting the pond side vegetation, preventing the establishment of large fish, managing the central open water and the numbers of emergent plants. We monitored the ponds every month and recorded the migration and breeding situation with respect to the giant water bug. In the preliminary monitoring survey in 2017 from May to July, we recorded nine giant water bug egg clutches, and giant water bugs from nymph to imago stages. We also recorded four species of diving beetle, as well as, plumbeous water snakes, Asian yellow pond turtles, and other indicator species of an aquatic environment. This survey could identify the giant water bug as an umbrella species in the farm pond ecosystem. Rare plants in the Tongxiao area included four critically endangered species, five endangered species, 10 vulnerable species, and four near-threatened species. Most of them were grassland species, so a restoration plan was started in March 2017. By July 2017, the number of species in the field under restoration increased from 11 to 53. These included species which were inadvertently transferred onto the site via soil or which emerged after tilling the field. By reading the relevant literature and carrying out local ecological surveys, we identified local conservation targets. We also monitored biodiversity and maintained habitats in the field, to identify important ecosystems and habitats. Based on these findings, we could use eco-friendly farming methods to secure ecosystem services. 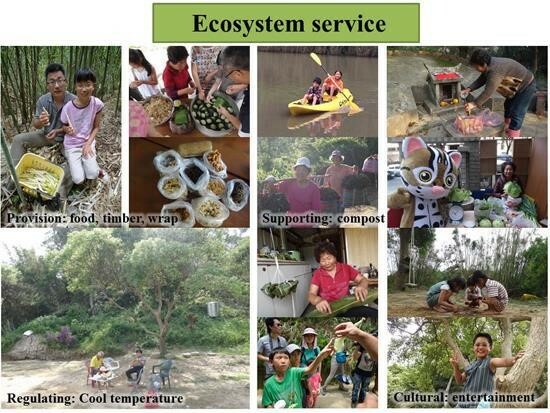 In addition, we guided visitors to help them understand ecosystem values, such as collecting bamboo shoots and making traditional pickles. We regarded local farmers as teachers, and learned traditional ecological knowledge and Hakka culture, which included growing rice and processing agriculture products. We also introduced modern techniques. 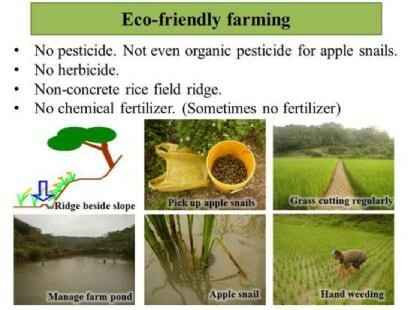 For example, we used agriculture product processing methods which fit modern food safety rules, tested rice-soybean crop rotation which could increase the fertility of the soil and decrease the harm caused by apple snails, and used a motorized weeding machine to increase weeding efficiency in paddy fields. Taking field monitoring results as reference, we practiced conservation plans, such as transplanting rare plants to the ridge and keeping bees. We also established social networks, to strive for public support through sharing our eco-friendly farming experiences and achievements. By connecting farmers in the countryside with customers in the urban areas, we strived to build a win-win situation system. We ensured farmer’s income by providing contract farming fees that depended on the farm area, rather than its productivity. 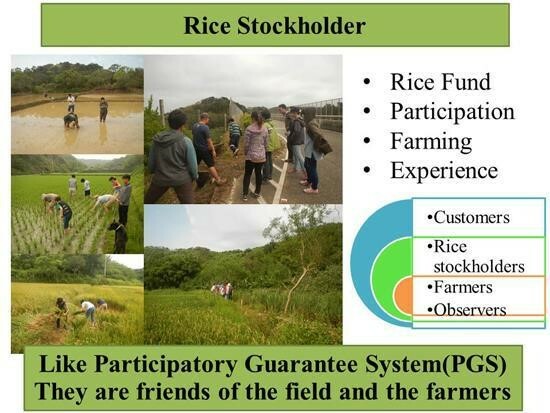 Using the rice stakeholder system, we introduced customers to farmers, promoted the dignity of the farmers and achieved positive interactions, letting customers become involved in the agricultural production system. Together, we share the risks and the achievements. Through inherited traditional farming wisdom and the introduction of modern techniques, the TianBie Rice Project stabilized the quality and yield of the local products, and ensured the income of the farmers. We also monitored the biodiversity in the field, and successfully practiced conservation projects. 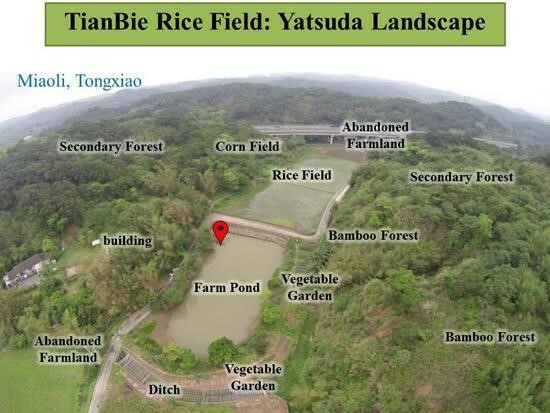 We hope that TianBei Rice could be an example for the Satoyama Initiative in Tongxiao, to carry out transformation of nature resource management in the area.